I don’t look happy, do I? Lately, I’ve been reading too many online posts about cats and kittens found alive in dumpsters. While these stories are hard to read and harder to comprehend, I’m going to report today on an atrocity that happened practically in my own backyard. Newark, NJ, isn’t that far from my little condo. All photos below are used by permission of Associated Humane Societies, Newark Branch. While I’d like to pass judgment on this woman, I can’t. She may have saved the kitties from an even worse situation. Maybe it was a hoarding situation gone wrong where the hoarder died and left the cats to starve. Still, she did put these cats lives in danger by leaving those overcrowded PTUs when the shelter was closed for the night. I just know my heart breaks as I stare into the innocent faces below. Five PTUs holding 42 cats. Photo ©Associated Humane Societies, Newark Branch. As you can imagine, these cats were all in rough shape. Seven cats had severe eye infections that actually made their eyes pop out of the sockets. Many others had lesser eye infections and upper respiratory illnesses. Some of the abandoned kittehs. The good news is that all the cats have survived their ordeal and are receiving medical treatment. They’ve all been inoculated and are being spayed/neutered/aborted. None of these cats are feral and the facility hasn’t had to euthanize any of them. They will soon be searching for their furever castles. 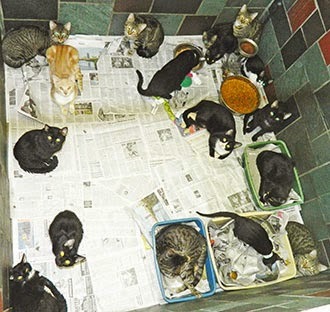 Due to overcrowding, some of the cats will be moved to other AHS facilities in NJ. Photos ©Associated Humane Societies, Newark Branch. How you can help. AHS needs donations of canned and dry cat food, cat treats, kitty litter and furever homes for these kittehs. To help care for these 42 cats, as well as the other cats in their facility, monetary donations to their Res-Q Fund are being accepted. Won’t you Be the Change for these babies? Read more about this story here and see an update with the woman’s photo here. This post is part of Blog the Change for Animals, an event held every 3 months to raise consciousness about animal related causes and charities. *'screams in blackest deepest FURY * This is insane CK this is utterly disgraceful those poor cats, I will share this post everywhere!!!! Holy Carp. Who knows what the back story is...at least they're all safe now. OMC, those poor kitties! My heart aches for them, and I am purring for them to get well and find good homes! 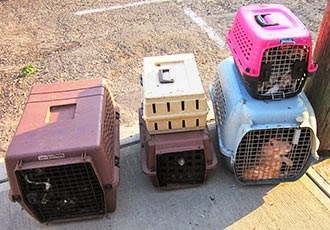 Poor kitties - glad they're all safe now and hope they find loving homes. Wow, I just cannot imagine that many cats fitting into those carriers... sometimes it is so easy to pass judgment on others, but there may be worse things she could have done. Like leave them in a dumpster. I hadn't heard this story yet CK, thanks for sharing. I am so sickened by this. I really think how people treat animals speaks greater volumes about them than any words. Our hearts are heavy and so very sad to hear about this story because it's repeated so many times every single day...there's just so much sadness in the world. We are so glad that they were saved of course - and that they have a chance for some kind of healthy and happy life....it's just so heartbreaking that these things happen AT ALL. We had heard about this and could hardly believ the situation. So very glad none had to be euthanized. We work with the MO Dept of Ag to intervene in hoarding situations at Wayside, it seems (sadly) once every few months or so. We've only had one case in 4 years that I know of where there weren't cats so far gone that we had no choice but to euthanize. Purring for happier times for these guys, with forever families of their own. Thank you for being the change for them today. it is hard not to be angry at someone for this, but.... the important part now is the cats are safe and alive and protected and will soon be available to loving homes. What an absolutely horrifying situation. Those poor little angels. Thank heavens they are getting the help they need. Such a sad situation that is repeated way to many times. Thanks for the info on how to help CK. Oh no what a horrible story. Poor kitties. But as you mentioned, it could be worse...glad they were found soon and they are getting treatment. I wish them a happy future in their forever homes. You're right, CK, they could be much better off now than where they were no matter where they came from. They may not be healthy but at least they are friendly, which means they were at least treated kindly at some point in their lives. I just don't understand sometimes. may bee sum two de purrson ? I am heartsick CK. Thank you for TNT service to them by telling about it. This is happening way too often. What people also don't realize most shelters are not equipped for a sudden large intake. They do the best they can but what's most needed after medical care are foster homes. those poor sweet kitties. I just tweeted, hope this helps! Absolutely horrible. I never will understand what makes some human's brain tick. I sure hope they can apprehend her and make her pay somehow for what she has done. Thanks for reporting this. Those poor innocent little babies! I am not even sure what to say. 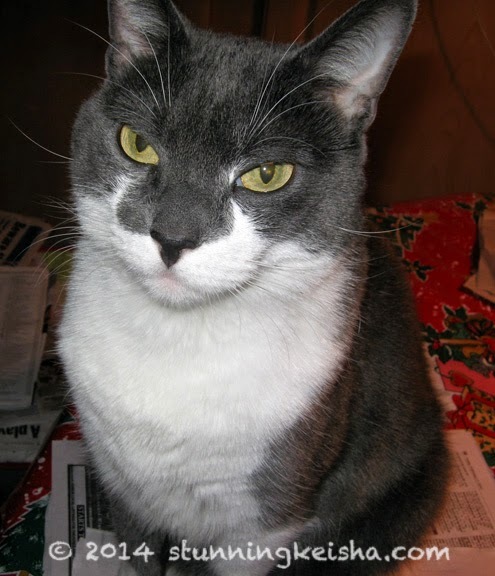 Although I am very relieved to hear that all of the kitties are getting the medical attention that they deserve. That is terrible. I am glad they are safe now and getting the medical treatment they need. We read about this earlier this week and have been trying to find out where to best follow the stories on how these kitties are doing. We're glad you featured this, CK, and we hope that this means brighter days ahead for these kitties. This makes us so very sad. So glad the kitties are OK now. We will purr for them and do what we can to help. Oh, CK.... this breaks our hearts. We can't even imagine the life these poor cats have led up to this point. Thank God they are getting help...and the fact that they are not feral hopefully means they will have a chance at being adopted. Oh this just breaks our heart, so unbelievably sad. We will be purring and praying for these sweet, innocent kitties. May they be blessed with love and loving forever homes. What some humans do is just beyond belief. Thank cod the shelter worker was there and took care of those kitties. We glad they all got the proper medical care and we purr that they find homes. It is such a sad sight. We are grateful the kitties are safe at the shelters and will be cared for from now on. Purrs to all. 42 cats in those PTU's? No way, we think we are crowded if we are in by ourselves. Excellent reporting, CK. We are purring health and happiness for the kitties. Those poor poor kitties. We're so glad they were found and rescued in time. Hopefully they weren't too traumatized by the ordeal and will get adopted quickly. Wow… that is unbelievable! So glad an office came by at the right time. Such great news that all of them survived and are getting the treatment they need and deserve. Sending lots of purrs that they find their furever homes soon! I don't think there is ANY excuse for this no matter what the situation was for how these cats came to be, and while it nay seem unfair to some to pass judgement I think that is exactly a big part of the problem-- people do not show outrage enough. Of course acting like a raving lunatic or freaking out is not going to help the issue, but if society were to show more outrage and intolerance by being proactive it can only help. Stricter, harsh laws for animal neglect, cruelty will help deter and show people this behavior is not tolerated; funding outreach programs to vulnerable populations like the elderly and low income, and counseling for people with mental illness; and continued education on the issues that lead to the reasons, risks that may lead to horrors like this. The problem is not just the woman who dumped these poor fur babies or animal hoarders-- it is all of us. Where is the outrage from more than just the animal welfare community? Why do we worry about jumping to conclusions when we should be prosecuting the cruel sociopaths and getting hoarders mental health treatment, etc? I do not profess to know the perfect solution, but I do know we are not doing enough.